Space shuttle Independence, a high-fidelity orbiter replica, pulls into its new parking spot at Space Center Houston on Tuesday, Dec. 17, 2013. HOUSTON — Space shuttle Independence has a new parking spot. Space Center Houston's full-size space shuttle replica embarked on a short trip on Tuesday (Dec. 17) as it was moved from its outdoor display location of more than a year to a spot in the adjacent parking lot. The replica, which earlier this year was named the space shuttle Independence, was repositioned to make way for the arrival next year of the original Shuttle Carrier Aircraft (SCA). The modified Boeing 747 jumbo jet will be topped by the shuttle replica to create a new $12 million, six-story attraction scheduled to open to the public in 2015. When completed, visitors to Space Center Houston will be able to tour inside both the carrier aircraft and the shuttle mockup sitting atop it. The SCA, which is also known by its tail number, NASA 905, was the first of NASA's two jets to ferry the orbiters across the nation in between the shuttles' flights to space. In November 2012, NASA 905 was flown to Ellington Field in Houston after completing the delivery of retired orbiters Discovery, Enterprise and Endeavour for their own public displays. Boeing, which originally built the 747 and then modified it to become the SCA in the 1970s, has donated the needed disassembly and reassembly services to move NASA 905 from Ellington Field to Space Center Houston. To date, the jumbo jet's four engines have been removed for reuse by NASA's airborne observatory SOFIA, and the associated nacelles have been moved to the space center to await the remainder of the aircraft. According to a schedule shared with collectSPACE.com, Boeing's engineers will begin working on the disassembly of NASA 905 on Feb. 3, 2014, removing its two wings and tail section from the fuselage. Delivery of the jet's parts to Space Center Houston is then targeted for the weekend of March 29. It is anticipated it will require approximately a month and a half to reassemble the aircraft. Once that's complete, work will then begin to mount the space shuttle Independence atop the jumbo jet for its display. Space Center Houston plans to erect a tower, including an elevator, to provide the public with walk-through access to the interiors of both the SCA and the orbiter replica. Both vehicles are slated to have their interiors refurbished, with multimedia exhibits going into the aircraft and an upgraded cockpit and crew cabin for the space shuttle mockup. 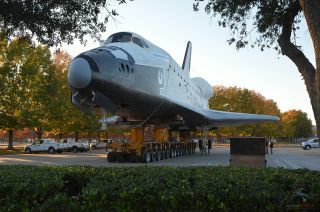 Click through to collectSPACE.com to see more photographs of the replica space shuttle Independence being moved.